Dreadlocks, twists, or any type of matted or coiled hair, the Afro-centric hairstyles of many black women in the Army, are now out. Sergeant Jasmine Jacobs of the National Guard in Georgia has always plaited her hair into two twists around her head. She has been in the military for six years and has worn her hair natural (meaning no chemical treatments [perms] or hair extensions [weaves]) for four of those years. But according to the new hair-grooming requirements the U.S. Army recently released, her hair is now out of regulation. And so are the Afro-centric hairstyles of many black women in the Army, who make up 31 percent of Army women. Jacobs, who has said she is “kind of at a loss now with what to do with my hair,” has started a White House petition asking the Army to rethink its new hair guidelines. The petition has collected more than 13,000 signatures from soldiers and civilians, but needs to reach 100,000 signatures by April 19 in order for the White House to address it. Females with natural hair take strides to style their natural hair in a professional manner when necessary; however, changes to AR 670-1 offer little to no options for females with natural hair.... These new changes are racially biased and the lack of regard for ethnic hair is apparent. 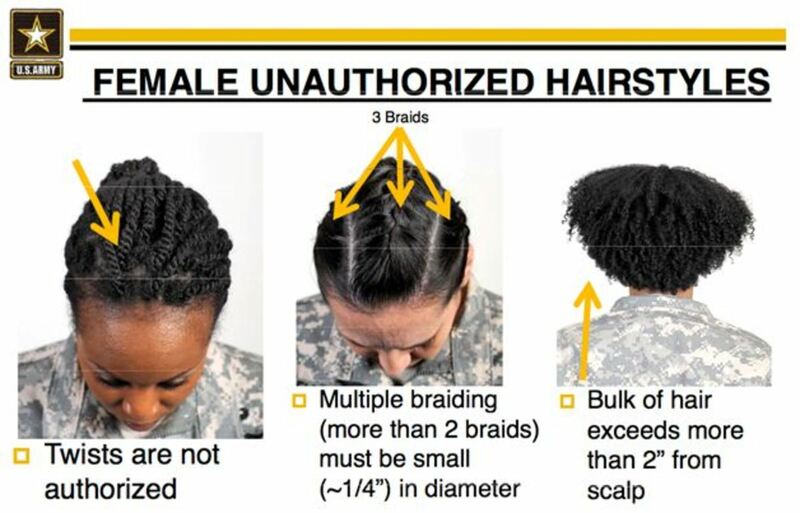 The new Army Regulation 670-1 (PDF) illustrates with photos the types of hairstyles that are unauthorized for women. Those include dreadlocks, twists, or any type of matted or coiled hair. A particularly cumbersome requirement disallows the bulk of a woman’s hair to "exceed more than 2" from her scalp." That rules out Afros and most types of non-chemically altered black hair. Basically, almost every natural hair option that black women in the Army could wear is now off limits. One of the few traditionally natural hairstyles that was listed as appropriate is cornrows, but a slew of specifications and rules surrounded even that. The diameter of each cornrow can’t be more than one-fourth of an inch, and no more than one-eighth of an inch of scalp may be shown between cornrows. The only way to realistically meet the new standards would be to shave one’s head, perm one’s hair or wear weaves or wigs. Jacobs said twists like the one she wears are very popular among black women soldiers because the style requires little maintenance when in the field. Her hair’s thickness and curliness makes pulling her hair back into a bun (a style popular among white women soldiers) impossible. A spokesperson for the Army said the grooming changes are “necessary to maintain uniformity within a military population.” When that need for “uniformity” erases the ethnic differences of a group of women and forces them to constrain themselves to European standards of hair, it presents a serious problem. “I think, at the end of the day, a lot of people don’t understand the complexities of natural hair.... I’m disappointed to see the Army, rather than inform themselves on how black people wear their hair, they’ve white-washed it all,” Jacobs said. Does It Really Matter If Women Soldiers Can't Do Pull-Ups? 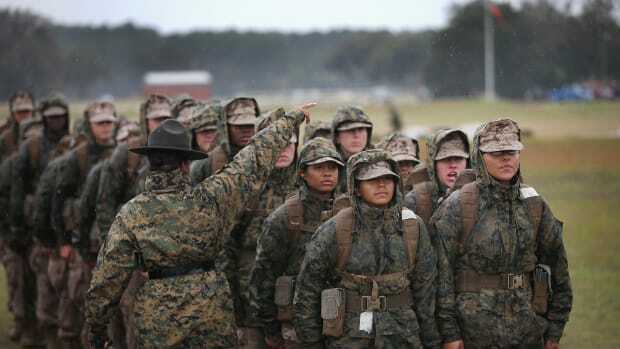 Starting in 2016, women will be able to serve in any combat role in the United States' armed forces. 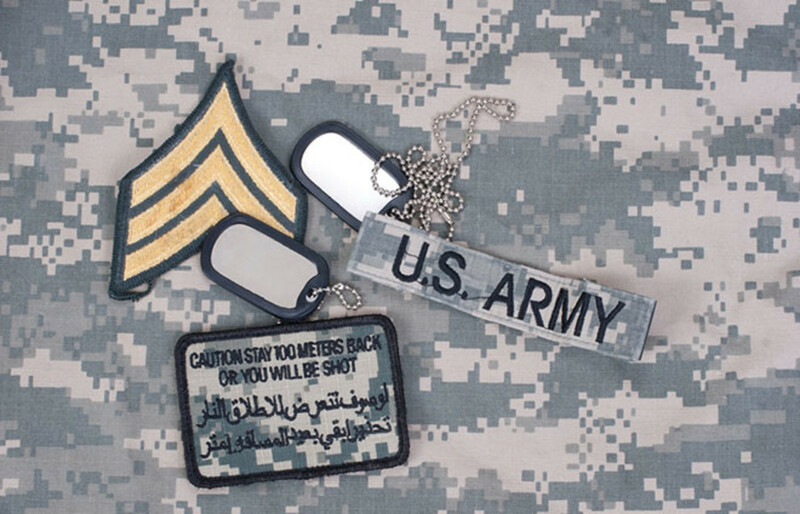 The era of "persistent conflict," as the U.S. Army describes it, may redefine the meaning of "victory" on the battlefield. 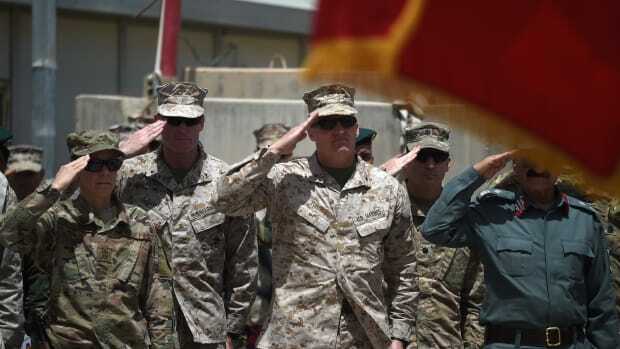 The attack is the largest on a U.S.-manned based in Afghanistan in years, and occurred as U.S. and Taliban representatives are negotiating a full U.S. troop withdrawal from the country. Four decades ago, America decided to both maintain a large professional standing military and end the draft. The predictions of those who studied the matter then largely have been borne out -- and not for the better. 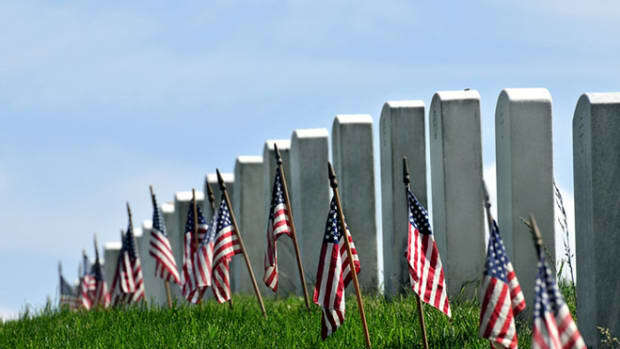 The military will exhume a grave in the Philippines that may hold the remains of Bud Kelder, an American POW whose family has long been fighting the Pentagon to get him home.